Overhead expenses sometimes can get you out of the game during a bidding process. Some of the things that you can do are summarized here and these actions will help you reduce overhead costs and still be profitable. Overhead costs are large portions of the project budget that can make up a huge difference in your proposal number, so here are some ideas on how to reduce those expenses. If you have a large vehicle and construction equipment fleet, you will need to analyze their fuel consumption and determine how these overhead costs can be reduced. Start by analyzing the quantity and size of your fleet to determine if you need to sell those unused vehicles or trucks or if you need to replace those old vehicles with newer or more efficient ones. There are solutions that can be established that will determine how much fuel your equipment is using, and you can always try to invest in hybrid, electric, or fuel-efficient vehicles. In addition, for those employees who need company vehicles, you can ask them not to take those vehicles home at the end of the day. The same rigorous environmental standards that people are using at home could be applied on the business premises. Any item that can be reused, such as paper, folders, and so on, should be reused. Items that cannot be reused should be recycled whenever possible, as this will not only reduce your purchasing costs, it could also reduce your trash collection bill. Be sure to look for new alternatives and use energy efficient bulbs, equipment, and vehicles. Positive reinforcement is always good. If an employee comes to you with an innovative solution, credit him for coming up with a cost-cutting idea that saves your company money. Creating incentive plans for beneficial ideas, such as employee discounts, added time off, free lunch for a week in the company cafeteria, or even a cash bonus, may win greater favor and support than just an honorable mention in the company newsletter. Employee empowerment can reduce your overhead expenses. Start by developing stronger relationships with fewer suppliers who are not focused on maximizing current margins but on creating long-term relationships. A good friend sometimes can get better and discounted prices for you, not to mention that the negotiation process will be faster and smoother. Create long-term contracts focused on volume discount that will save you money. Investigate ways that your company can do things faster at a reduced cost. Make sure your practices and procedures are up-to-date and look for streamlined processes. Incorporate energy-efficient lighting and cleaner ways to operate into the plan. Use software and new tools that will reduce the time to complete reporting and compiling information; this will help you reduce overhead costs. Make use of cloud services and other free software technologies that can be implemented easily and hassle-free. In difficult economic market times, we are all trying to do more with less. Maximum productivity from each employee is the goal. 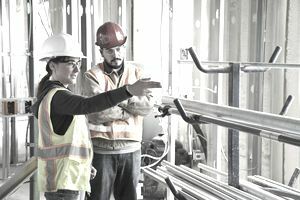 Identify or hire workers that can serve in multiple roles and eliminate downtime while they are waiting on another key task in the critical path of construction. Construction materials can be purchased tax-free and then warehoused until needed for a construction contract. Transaction taxes are not due until they are transferred to the entity performing the construction, normally resulting in an immediate cash saving by delaying the payment of tax. A side benefit to a purchasing company may accrue to the contractor by allowing a more centralized approach to inventory management. Spend Money? Key employees need to be cared for and kept happy. Look at long-term compensation and retention programs to make sure that your key employees stay with you during tough times. Invest in safety programs and training tools for lowering workers' compensation costs. Sit down with employees and getting their opinions as to how overhead can best be trimmed.